Have you ever been in an important meeting when you suddenly felt a throbbing pain in your head that you just can’t concentrate anymore? Have you experienced getting really excited about a date or a concert for days, but when it’s about to start, your nasty headache just attacks you? These are really disappointing situations that could happen to anyone. Headache comes in many forms, but when it attacks you, it can be really taxing. To ensure that you’d have a great day without the interference of a headache, here are the most effective ways on how to prevent its next attack on you. Study yourself and get to know your health and lifestyle better. Know the primary causes of your headache so you’ll be equipped with more ways to prevent and cure it. Do you sleep up late every night? 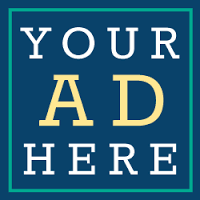 Are you an alcohol drinker? Do you smoke? Do you have a history of migraine? These questions and other medical history should help you identify the right approaches of treating your headache. Do some stretching. If you are not a fan of simple, home exercises, now is the right time to start. Stretching can actually help relieve muscle tension that adds to the pain in the head. Make sure to focus on neck stretches as most tension headaches originate from the head. Make it a habit to do a 20-minute stretching exercise in the morning and in the afternoon. And since you have already started with stretching, continue to engage in aerobic exercise. According to National Pain Foundation, doing regular aerobic exercises a few minutes every day can minimize the frequency and intensity of migraine attacks. Examples of aerobic exercises you can try are biking, swimming, and brisk walking. Another type of exercise that you need to learn and practice is relaxation exercises. These include relaxing to music, proper deep breathing, and using mental imagery that helps a patient unwind and relieve stress. The idea of relaxation exercises is to consciously relax tight and stressed muscle groups that may be causing your headache. In relation to relaxation, you may also want to get a massage to relieve your headache. Whether you do it to yourself or have a masseuse give a massage to your, it will provide temporary relief. To do it on your own, apply essential oil to your hands and rub your temples. The pain will momentarily disappear, but once you feel it again, you will have to repeat the massage. Acupuncture is an alternative medicine treatment than can prevent acute migraines and chronic tension headaches. This is done by inserting thin needles under the skin of certain parts of the head and face to realign the flow of energy. Another alternative medicine option in preventing headache is chiropractic treatment. With this procedure, spinal manipulation and nerve adjustments are done. Since most tension headaches originate from injured tissues in the neck, chiropractic manipulation can restore the mobility of the tissue and function of the injured nerve, eliminating the pain in your head. Biofeedback is another popular approach to prevent the outburst of tension headaches and migraines. It uses electronic sensors that enables monitoring of body functions including heart rate, blood pressure, skin temperature, and muscle tension, and teaches patients how to control their bodily responses, i.e. how to ease tight muscles to prevent headache. The heat and cold therapy is another way to prevent and cure headache. By applying heat at the back of the neck, neck tightness will improve; while icing the temples will relieve a pulsating headache. This is considered a no-risk therapy as it is safe even for pregnant women. Do you know that there are foods that can easily alleviate headaches? If you must, try consuming coffee, banana, spices, bread, and salad and see how the pain in your head slowly goes away. Headache may also be triggered by certain food and drinks. If you know what your triggers are, better to skip them altogether. With these proven headache busters, you will be able to fight the irritating pain in your head even before it attacks you. Not many people know that one of the major areas of specialization of Doctors of Chiropractic is Nutrition. Nutrition is a core curriculum in Chiropractic education and takes one year to complete. Chiropractors are licensed by the state board to advise on nutrition and vitamin and supplement therapy. Chiropractors are better educated and trained in nutrition than most medical practitioners. Nutrition is not a required subject in Medical School. Medical doctors, for example, do not study nutrition unless they take it as an elective. Majority of Oncologists do not study nutrition nor do they know the healing power of vitamins. Yet they are the first to prescribe vitamins and supplements and judge their effectiveness or dangerous effects. In the course of their education, chiropractors study all the building blocks of the body – from cells, to tissues to organs – and the important roles food and nutrition play in the person’s overall health. A two-year certified nutritionist has not studied all the nutrition-related subjects a chiropractor has. Neither have most four-year certified nutritionists. These nutritionists’ training are inclined to mainstream medical. They are not as holistic as a chiropractor’s training. In chiropractic care, optimal nutrition is taught and practiced in conjunction with the application of chiropractic therapy. The approach, which combines the effective chiropractic treatment techniques, proper nutrition, and healthy lifestyle, is seen to bring the best results to the patient. Do physical exercise for at least 20 to 30 minutes three times a week. Eat out less often to avoid high amounts of unwanted fats and sugar. Control your food’s fat and sugar content by preparing them. Quit smoking and limit alcohol intake. Excessive alcohol and smoking hinder the absorption of nutrients in your body. Try eating more raw rather than cooked or canned food. Choose organic food when possible. Take regular amount s of fiber through the food you eat. 25 to 30 grams is recommended. Drink 8 to 10 glasses of water a day and avoid coffee, tea and soft drinks. Go for good vegetarian diet. It can prevent heart disease and other diseases, even cancer. Have your iron and B12 levels checked at least once a year. Dietary supplements should not be considered as substitutes for foods. Supplements when taken properly can greatly help to achieve optimum health. With nutritional supplements, consume dark green vegetables, nuts, seeds and oils. They are good sources of many vitamins and minerals, magnesium, and fatty acids. Consult a health care practitioner on nutritional health concerns and to determine the best dietary supplements for you. You should, all the more, seek professional help from a health care provider who specializes in nutrition if you have symptoms such as chronic fatigue, headaches or heart problems. Chiropractors are among the best-educated and trained health care providers in nutrition. Smoking is evil and everybody knows it. The bad effects of smoking to our health is acknowledged by the medical community, the public, the government, and even by the tobacco companies themselves. The ill effects of smoking have been long known to cause diseases of the heart and lungs, along with many other unwanted conditions of the body. But what could be the effects of smoking to your bones and tissues? Studies show that smoking can also cause damage to your bones and tissues. And when you think that your bone structures include the spine, the communication center of your nerve system, you will shudder at the thought of the havoc that smoking can bring to your body and your life. The spine consists of the vertebrae, vertebral discs, joints, and connective tissues and the muscles and nerves attached to them. The nicotine and other toxins in the smoke from cigarettes can damage the normal functions of your spine and nervous system as a whole. Recent studies have shown that smoking can cause damage to all the parts of your spine, negatively affecting their functions. Vertebrae – Smoking can cause reduced bone density, which can lead to greater risk of osteoporosis, spinal arthritis, facet disease and other deterioration in the spine. Intervertebral discs – As they are, these discs that separate the adjacent vertebrae have very low supply of blood. The effects of smoking can further restrict the blood circulation and make impossible the flow of nutrients they need to function normally. Connective tissues – Collagen levels are reduced by nicotine, making the soft tissues and cartilage lose elasticity and resilience. Ligaments and tendons become prone to injury. Nerves – With the weakening of the vertebrae, intervertebral discs and cartilage, the possibility of herniated or bulging disc increases. This disc condition can impinge on the spinal nerves. Muscles – Smoking has degenerative effects on the muscles. Also, the harm to the lungs smoking brings can result to inactivity, which can lead to lower muscle mass. 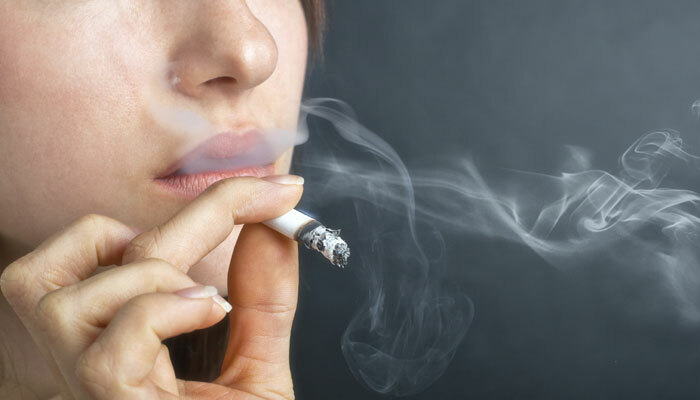 A prolonged research on the effects of smoking to the musculoskeletal system discovered that smoking, coronary artery disease and hypertension were strongly associated with the development of low back pain. Another conclusion from that research was that smoking, hypertension and cholesterol were significant factors in the the development of lumbar spondylosis. Spondylosis of the lumbar are degenerative changes in the lumbar spine such as osteoarthritis of the vertebral joints and degenerative disc disease in the low back. More evidences on the bad effects of smoking are surfacing with the results from medical researches and studies. It’s not just the heart and lungs that are seriously affected by the bad habit of smoking, but the spine as well. A healthy spine is just as vital to our health and well being as the heart and lungs are. The development of bones in your body is constantly evolving. The old bones breakdown while new ones replace them. Until in your 30’s there are more new bones being developed than there are old bones breaking down. You reach the peak of your bone density right around this period, after which the rate of old bone breakdown overtakes the rate of bone replacement. This is also the start of the deterioration of your bone structures. With aging comes wear and tear of your body and the degeneration of its organs. The process can result to weaker bones. The process of bone development lets the bones to be progressively weaker and more brittle over time. Mild to moderate changes of this kind is what doctors call osteopenia. The condition when there is significant bone loss is called osteoporosis. Statistics from the American Academy of Orthopedic Surgeons show that of the Americans over 50 years old, 50 percent of the women and 25 percent of the men will experience bone fracture due to osteoporosis. The common conditions of broken bones are those of the hips, arm, leg, wrist. Broken hip is the most serious. It not only affects movement but also the person’s quality of life. The real cause of osteoporosis is not known even by the medical doctors. What they have positively identified are the factors that increase the risk of osteoporosis and those who are at risk for this condition. Getting old – People over 50 have higher risks. Having history of osteoporosis in the family – Those with parents or siblings who have osteoporosis are more likely to experience it also. Female gender and having experienced menopause – Women have lower bone destiny than men due to hormonal differences. Menopause decreases a women’s estrogen level, which lead to bone loss. These factors increase the risk for osteoporosis. Caucasian or of Asian descent – Whites and those of Asian origin are more susceptible to this condition than other races. Having height loss over time – Age-related height loss indicates decreasing bone mass and density. Low body mass – Those with small body build are at a higher risk because of lower bone mass where the body will get calcium from. Having history of hypothyroidism and Cushing’s disease – These are hormone-related medical conditions. Lack of calcium and Vitamin D – Calcium is vital for a healthy bone development. Vitamin D facilitates calcium production. Lack of physical activity – Regular physical exercise strengthens the bones. Smoking and excessive alcohol – Nicotine and toxins from tobacco smoke and alcohol interfere with the body’s ability to absorb calcium. Another unfortunate fact on your bones is that bone mass and structures, once lost, cannot be replaced. 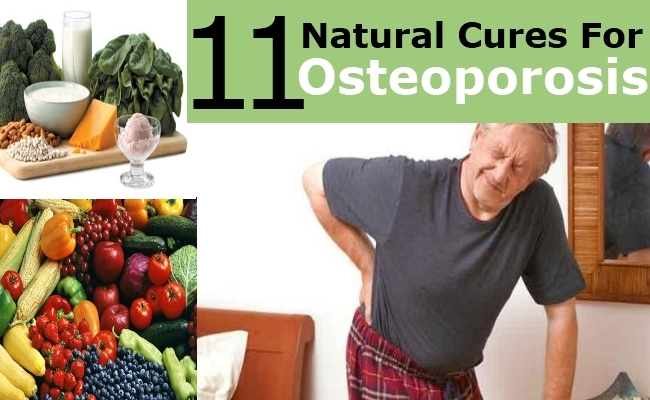 Treatment for osteoporosis is focused on retaining whatever bone mass there is in a person. Medications – Estrogen replacement therapy for women may be prescribed. Other medications to prevent bone loss and encourage bone maintenance include calcitonin and bisphosphonates. Home care – Prescribing healthy diet and regular weight-bearing exercises are examples of home care activities. Chiropractic care – Treatment by a chiropractor may involve bone preventive health care utilizing chiropractic principles. Be proactive in preventing osteoporosis. Initiate changes in your lifestyle now to favor healthy bone development and improve overall bone health. 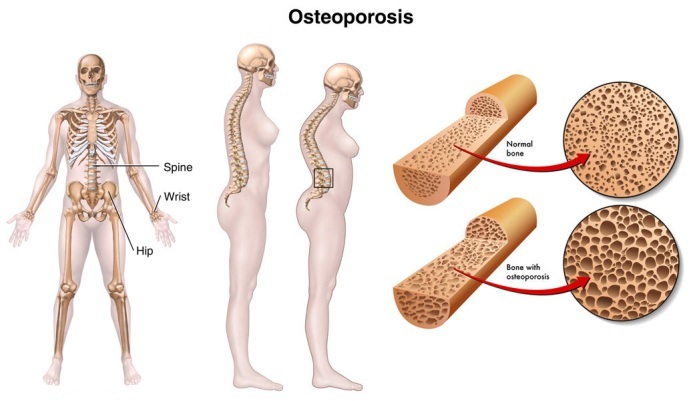 Osteoporosis is a disease in which the bone mass becomes low and the bone tissues deteriorate. If left untreated this could lead to increased bone fragility and risk fracture, particularly in the hips, spine and wrists. This bone disease is most dangerous being that bone loss occurs without symptoms and cannot be detected easily unless in its acute stages. Osteoporosis can greatly affect the quality of life of those who have the disease. It can actually lead to disfigurement and almost always causes decreased self-esteem. This disease could also greatly affect the mobility of a person and thereby increasing a person’s dependence on tools and people for assistance and other support this in turn can cause much embarrassment to the person victimized by this disease and a decrease view of self-worth. Similarly, osteoporosis is a disease that can also put a lot of strain in one’s finances. The cost of treatment of fractures are quite expensive and the long term and some permanent care for majority of the cases are truly hard to constantly maintain primarily because of the high priced medications, consistent check-ups and tests alongside other supplements to improve bone strength. 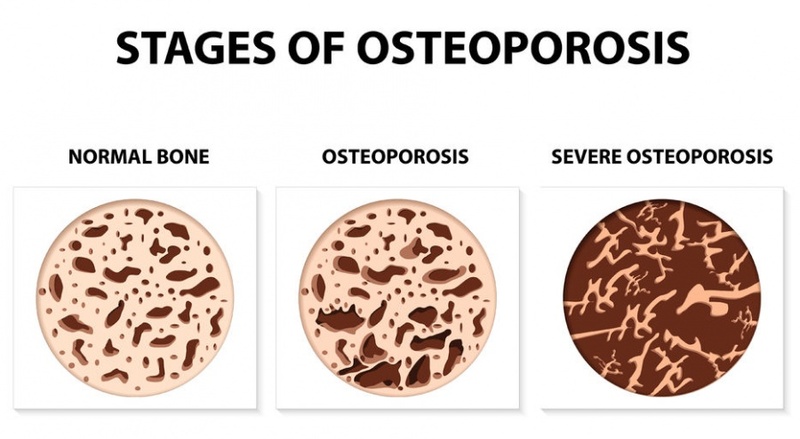 In all of these, it should be remembered that it is never too late to take steps at keeping your bones strong and healthy and to prevent osteoporosis. With proper instructions and information, patience and discipline battling the possibility of osteoporosis will not pose any difficulty. There are some simple ways that one can do to prevent osteoporosis. One way is it to increase your calcium ingestion by making sure that your meals always contains foods with calcium. Similarly, consistent exercise in order for you to prevent excessive weight gain that could put unnecessary strains to your joint and bones could also be resorted to. You must also observe and maintain proper posture all the time. Sit up straight and stand up with both feet on the ground, carrying your body weight. Good posture can help you prevent other disorders such as back pain, neck pain, and spinal disorders. Chiropractic care has been found to keep the muscles, nerves, and joints in place and functioning efficiently. Engaging in chiropractic adjustments regularly can significantly help keep your spine healthy and strong, and thus prevent the onset of osteoporosis. They say that we always regret at the end. Before that even happens, let us be mindful of our health, especially our bones, because once they deteriorate, it would be difficult to bring them back to what they were before. Bones are a vital part of your body. They are the frame and support structure of your body, protect your organs and anchoring muscles. The bones in your body are constantly developing with the old bones breaking down and being absorbed and new ones replacing them. There are more new bones developed by your body than there are old ones being absorbed until you are about 30 years old. From this time onwards, the development process slows down and the rate of new bones being developed will be less than the bones breaking down. In other words, you will lose more bones than it replaces. Your bone density will decrease as you age, from your 30’s. Your bones become progressively weaker and more brittle. When mild to moderate changes in the bone integrity occur, doctors call it the condition osteopenia. When significant bone loss starts to happen, it is called osteoporosis. The progressive changes in your bones with the onset of osteoporosis do not cause painful symptoms, which makes it diifficult to detect. The risk of bone fractures resulting from the weakening bones becomes higher. The American Academy of Orthopedic Surgeons (AAOS) revealed that 50 percent of women and 25 percent of men aged 50 and older will suffer from a broken bone from osteoporosis. The injury may be in the wrist, arm, hip or leg. A broken hip is the most serious of these cases. It can cause restriction in movement and affect the quality of life of the affected person. In extreme case, the person’s life may be at risk as a result of a broken hip. Old age – The normal process of bone development will cause your bones to be weaker and more brittle and osteoporosis may come in. Family History – Those whose parents or siblings have experienced osteoporosis have higher risk of having it also. Race – Whites and people with Asian descent have higher risks. Unhealthy lifestyle – Smoking, excessive drinking, caffeine and lack of physical activity can contribute to having weak bones. Taking certain medications – Some medications such as anticonvulsants and glucocorticoids can actually cause bone mineral loss. Low body mass – People with low body mass have less bone mass. Having experienced menopause – Decreasing estrogen level increase the risk of osteoporosis. Osteoporosis has been described as a “silent “ disease because it does not show any symptom. The symptom, most of the time, is painful when the patient has already suffered a fracture. While most of the identified risk factors are uncontrollable, there are a few that you can control like the intake of calcium and avoiding an unhealthy lifestyle. Work on these and avoid the bitter consequence of having osteoporosis and missing out on a lot of what a healthy life can offer. People of all ages can benefit from chiropractic care. In some countries, it is normal to include a chiropractor in the birthing team to provide necessary chiropractic care to the newly born. It is not uncommon for newly born babies to be born with musculoskeletal disorders. Many children are receiving chiropractic care. To a large extent, this is the due to their parents’ decision to bring them to the chiropractor for examination and care. These adults, usually, are recipients of the effective chiropractic care themselves and are convinced of chiropractic’s benefits even for young children. The advantages chiropractic care brings extend to the the seniors. The interest of the elderly are, in fact, one of the chiropractic profession’s priorities. Relief from Pain. One of the most effective and safest options available for pain relief is chiropractic treatment. Many cases of back pain, the most common complaint of seniors, especially, are normally traced to the disorders of the spine and the surrounding tissues. Spinal adjustments performed by chiropractic doctors, which are aimed at correcting subluxations or alignment problems in the spine, are very effective in significantly relieving pain and perhaps eliminating it. The medications commonly prescribed by medical doctors for pain offer only temporary and short relief and does not address the underlying cause of the problem. Increased Range of Motion. The increased range of motion of the spine and in the extremities is another great benefit chiropractic adjustments will give the seniors. This will allow them to bend, move and enjoy playing with their grandchildren better. It will also give them the opportunity to try some physical activities or sports they are unable to enjoy previously with their back conditions. Decreased Degeneration of the Spine. With aging comes the normal deterioration of body parts. Subluxations of the spine is one of the more common conditions seen in the elderly, most specially. Regular chiropractic alignments is advised for people of all ages, and even more for the seniors. N ormalizing the spinal alignment and reducing the stress in the spine can decrease degeneration of the spine. Improved Balance and Coordination. Degeneration or injury in the cervical spine located in the neck region leads to problems in balance and coordination among the aging population. With aging, the mechanoreceptors in the cervical joints, which provide inputs on the position of the head relative to the body is impaired. This condition results to loss of balance and coordination in the movement of the body. Chiropractic care can stimulate the mechanoreceptors in the cervical spine, helping to restore balance and coordination. Prevents Incidence of Falling. According to a study, falls constitute 90% of the cause of the more than 0.8 million cases of bone fractures in Americans older than 65 years. Through chiropractic adjustments of the spine, particularly in the cervical area, the mechanoreceptors are normalized and its functions restored. Stretching and physical exercises to improve strength, mobility, flexibility, balance and coordination are also incorporated in the administration of the chiropractic care. There is more to chiropractic care than just pain relief. What is more important is the overall benefits it brings to the senior citizens to allow them to stay healthy, feel good, do the activities that make them happy and enjoy life. Physical exercise is not just about losing weight or toning muscles. Learn some of the many benefits of exercise, working out, and staying physically fit. There are different exercise programs that we may use depending on what we want or what we need for our body. For instance, if you are kind of slender for your body size and need to gain a little more weight, there are weight-gain programs that you can work on. If you are overweight, on the other hand, weight loss programs are also available. Once you have achieved your desired body size, exercise will also help you maintain your ideal weight. Exercise helps in blood circulation and proper breathing. Aerobic exercises are good for respiratory activities and breathing. Cycling, stepping, jogging, and other aerobic exercises help in proper blood circulation and breathing. They help strengthen the lungs and normalize heart activities, preventing you from suffering from asthma attacks and heart diseases. Exercise helps tone the muscles. Do you have too much unwanted fat in the body? Turn them into muscles by having a regular work out regime. With proper muscle-toning weight exercises, you can reduce the layers of fat that covers the muscles you developed through exercise. Moreover, exercise strengthens the muscles and prevents tensions and tightness. Exercise also strengthens the body and stamina. With regular exercise, the muscles get used to strenuous work and enable you to do physically challenging work without getting tired easily. It would enable you to walk or run for longer periods of time, even while carrying heavy objects. It also prevents you from suffering back pains, neck pains, sports injuries, and arm and leg injuries which people who don’t engage in exercises easily acquire. Exercise increases self-esteem and improves self-confidence. Mastering a task as physical as exercise – and knowing that others are not able to – is enough to make you feel good about yourself. Also, mapping up how you have improved through exercise can give you a better self-image that will increase your self-esteem. A physically fit and toned body will definitely boost your self-confidence to the highest level. A work out regime that’s perfect for your body, ability, and lifestyle will get your blood flowing and give you a good relaxed feeling afterwards. Studies show that people who exercise regularly get stressed less and feel happier more. Are you into sports? 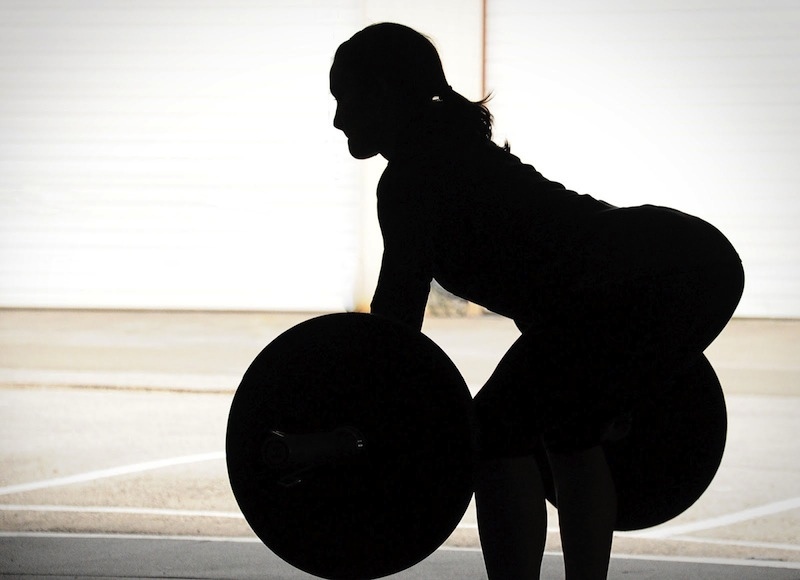 Are you fit enough to throw your body around and absorb physical fatigue every once in a while? If you like sports so much, beware! You may be at risk of injuring yourself. With the right information, however, you can minimize the occurrence of mild and serious sports injuries, including back pain, neck pain, arm fracture, sprained ankle, and more. It is wise to be aware of these types of sports injuries, so you can take the necessary steps on how to avoid injuries brought by sports. An internal knee injury commonly happens in sports wherein forceful movements or abrupt changes in direction occur. It is often caused by torn cartilage and vital ligaments. Overuse injury, on the other hand, is caused by the continuous and repetitive abuse of the limbs without giving them enough time to recover. This leads to trauma of the tissue that is aggravated by more activities. If not addressed immediately, it could result to chronic injuries that are difficult to treat. There are also the sprains and strains. A strain is a torn or pulled tendon or muscle, while a sprain is a tear of one or more of the ligaments supporting the joints and bones. Both injuries are caused by sudden movements and overstretching that cannot be tolerated by the joints anymore. Now that you already know the different types of injuries brought by sports, the next step is to know the factors to consider in order minimizing the risk of injury. These are the in the form of intrinsic variables, extrinsic variables, and the nature of the sport. Intrinsic variables are internal factors or things that concern the individual. Taking this into consideration, to avoid serious injuries, you must know your physical limitations. If you want to improve your fitness and strength, actively participate in a training regimen that will improve your body’s flexibility. Extrinsic variables, on the other hand, have to do with environmental factors such as the safety of the playing field, right equipment, and right temperature. To ensure that they will not cause you any injury, secure your playing area first and make sure that you have all the equipment you need. Lastly, each sport has its own qualities and skill requirements so make sure to execute the proper techniques and forms. Oh, and by the way, always listen to your body. If it is already telling you to slow it down, take a rest. If you are an active sports player, you may have already experienced suffering from one or all of the injuries mentioned above. It’s common, you may think to yourself. But the more you ignore them, the worse they will get over time. To deal with past and present injuries, no matter some small or trivial, go to your doctor, therapist, or chiropractor to have them diagnosed and treated. For problems involving the back, neck, and muscles of other parts of the body, it is best to get chiropractic adjustment to ensure that dislocated and damaged nerves get restored to their original position, thereby relieving any pain your feeling and bringing back optimum physical health. When you are completely back in shape, you can give your 100% again to every game you play.